Previous blog posts in this series on health care have reviewed how the US spends far more than other countries yet achieves only mediocre results, how the prices charged for similar medical treatments can vary enormously even for hospitals that might be physically across the street from each other, and how this fragmentation and other factors in the US health care market have led to profits and compensation for at least some top individuals that can be enormous. One other characteristic that needs to be understood before we go into the economics of the health insurance market and possible reforms, is the extremely high degree to which health costs are concentrated on a relatively small number of patients. The graph above is copied from a July 2012 analysis of the National Institute for Health Care Management, and is based on data taken from the 2009 Medical Expenditure Panel Survey (MEPS) of the US Department of Health and Human Services. As shown in that graph, just 5% of the US population accounted for close to 50% of all US health care spending (for treatment of patients) in 2009. The top 1% of the population alone accounted for 22% of health care spending. And the bottom 50% of the population accounted only for less than 3% of the spending. It should not be surprising that health care spending is concentrated. That is why we carry health insurance. Insurance is to cover costs that may be high in some given year but are also, and hopefully, relatively infrequent and affect only a few of the population. But the degree of concentration may be surprising to some, and the implications of such concentration on the design of an appropriate health financing reform have often been ignored. Before we go into some of those implications, a few other facts are relevant. First, the graph above on concentration of costs covers expenditures over the course of one calendar year. There will be less concentration when one looks at the costs over several years, since for at least some individuals there will a treatment in one year which will hopefully cure the condition and lead to less need for treatment in future years. But there is actually still a high degree of persistence in such spending from year to year. Using data from the 2008 and 2009 Medical Expenditure Panel Surveys, Dr. Steven Cohen and William Yu reported in a 2012 note that 20% of those in the top 1% of spending in 2008 were again in the top 1% in 2009, even though by construct they were only 1% of the population. They also found that 38% of those in the top 5% in 2008 were again in the top 5% in 2009. And there were similar over-representations in the other groups. That is, there is significant continuity in costs incurred from one year to the next. The very sick tend to remain so and continue to require costly care. Second, part of the reason for this continuity is that a very high proportion of costs are incurred for the treatment of chronic conditions. Specifically, and also based on Medical Panel Expenditure Survey data (this time from the 2006 survey), an analysis by Dr. Gerard Anderson of Johns Hopkins found that 84% of total US health care spending is for treatment of individuals who have chronic conditions such as diabetes or heart disease. These conditions carry over from one year to the next, and are rarely completely cured. This concentration of costs, with a high share coming from the need to treat chronic conditions, has important implications when considering any health care financing reform. Specifically, it makes it clear that the reform needs to focus on the treatment of the high cost individuals, in particular those with chronic conditions. That is where the spending is, and therefore that is where one will need to focus for there to be significant savings. 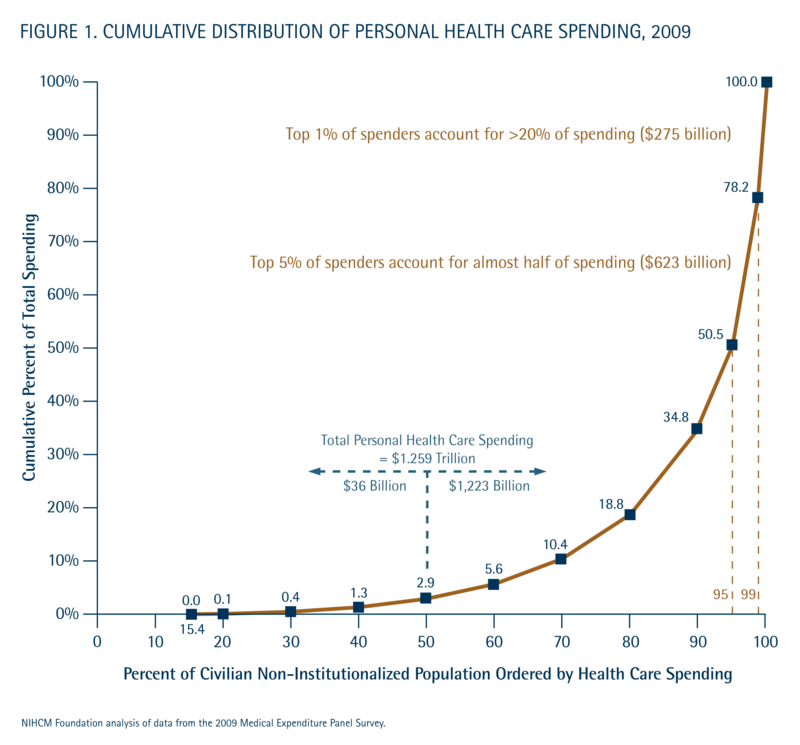 As noted above, the bottom 50% of the population accounts for only less than 3% of health care spending. Even if such expenditures were cut in half, the savings would only be 1.5% of total health care spending. In contrast, the costs in treating the top 1% is over 20% of US health care spending. If these costs could be cut by just 7%, one would generate more savings than cutting the costs of the bottom 50% of the population by half. And just a 15% cut in the costs of the top 1% would save more than the complete elimination of all medical spending for the bottom 50%. Thus it is clear that one needs to focus on the expensive treatments and the care of those with chronic conditions. That is where the money is being spent. And as was documented in the earlier blog post on the variation in health care prices, the differences in prices for such health care procedures can be huge. For a heart bypass operation, for example, the median price charged in the US in 2012 was $73,420. But the cost was less than $46,547 in 25% of the cases. At the other extreme, the costs were over $150,515 in 5% of the cases. A system which would bring down the high end prices to just the current median, or better to the levels that are adequate in a quarter of the cases, would lead to huge savings. But while this need to focus on the costs of the high-end procedures would seem clear, much of the conservative critique of the US health care insurance system is focused on trying to achieve savings among those at the opposite end of this spectrum. That is, the conservative critique is that US households wastefully consume “too much” in health care services, because (they assert) the households do not face the full price of the care. With insurance, the households pay only the coinsurance rate (after the deductible) of possibly 20%, and in many cases pay no coinsurance rate at all. Thus conservatives recommend moving US households onto high deductible insurance plans, where the patients pay 100% of the costs up to the deductible amount, and then have insurance only for costs above this (i.e. catastrophic care plans). The presumption is that patients then will not go to see doctors unless they really need to, as they will be paying the full cost until the deductible is used up, and will be careful to keep costs down when they do see a doctor. The problem with this is that while this might lead to fewer doctor visits for those in the population whose health care costs are less than their deductible each year, it will do nothing for those whose medical costs are high. They will have already used up their deductible anyway. And as noted above, due to the concentration of health care costs on a relatively small share of the population, the savings on the rest will not matter much. The bottom 50% of the population accounts for only less than 3% of health care costs. But the results can be far worse. Avoiding seeing a doctor early, when one suspects some medical issue but are not sure (as we are not doctors), can lead to far higher costs later if that condition develops into something serious. A doctor’s visit is not costly (the average in 2011 according to the MEPS was $230), but a cancer that develops or a heart condition left untreated can lead to extremely costly treatment later. While some of the high deductible health insurance plans will try to avoid this by covering things like routine annual check-ups outside of the deductible (and under Obamacare they are now required to do this for a specific list of such routine check-ups and tests), not all such checks are covered. What an individual needs depends on that individual, and basic rules that apply to all will only cover a portion of these. Conservatives have, however, used tax law to encourage a shift of consumers onto such high deductible health insurance plans. The initial push was the creation of the Medical Savings Account in 1996, championed by the conservative Republican Congressman Bill Archer of Texas. These are now called Archer MSAs. These plans were primarily for the self-employed, and provided substantial tax advantages for an individual to use them. In 2003, during the Bush administration, these were then substantially extended to the current program of Health Savings Accounts. There are substantial tax advantages to such accounts. Funds placed in them and used for medical expenses are not subject to income tax, and the investment income earned on the sums in the accounts are similarly not taxed (broadly similar to an IRA). And these tax advantages will accrue primarily to those in the higher income tax brackets (the rich) and those who expect to spend less than the deductible each year (the relatively healthy and those who are younger). The funds placed in these accounts also generate substantial fund management fees (generally 1 to 2% of assets annually) for the banks and other financial institutions who manage them. Thus there are now important vested interests in maintaining such Health Savings Accounts, and Obamacare never fully addressed the issue given the political challenges. Health Savings Accounts still exist, and while the standards set under Obamacare for an adequate health insurance plan limit total out-of-pocket expenses, plan deductibles can still be high (although not as high as existed before in some insurance plans). Total out-of-pocket expenses (and hence the deductible) can now be no higher than $6,350 for an individual and $12,700 for a family, but this is still a lot. But high deductible health insurance plans have failed in bringing down the high cost of medical care in the US, as they never addressed where the problem lies.